I know, I’ve posted this before but artichokes are back in season so I want to repost it. Artichokes, boy do we have a lot of them! Sometimes we’ve got as much as 20lbs of them languishing in the refrigerator. And really, you can only eat them boiled, steamed or barbequed so many times. So I needed to do something with them before we had to throw them out. Preserving them seemed to be the best option. Little did I know that preserving them would get us to eat them even faster! Of the 4 quarts we canned, only one remains 2 weeks later. 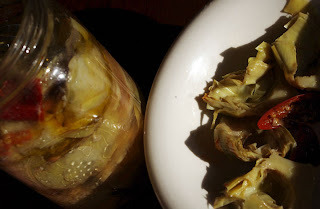 I started with Hank Shaw’s Pickled Artichoke recipe but made a couple of changes based on my personal preferences and what we had on hand. This recipe creates a very refreshing and bright flavor that you just want to keep eating. 1. Combine all ingredients but artichokes and halved lemons in a stockpot and bring to a boil. 2. 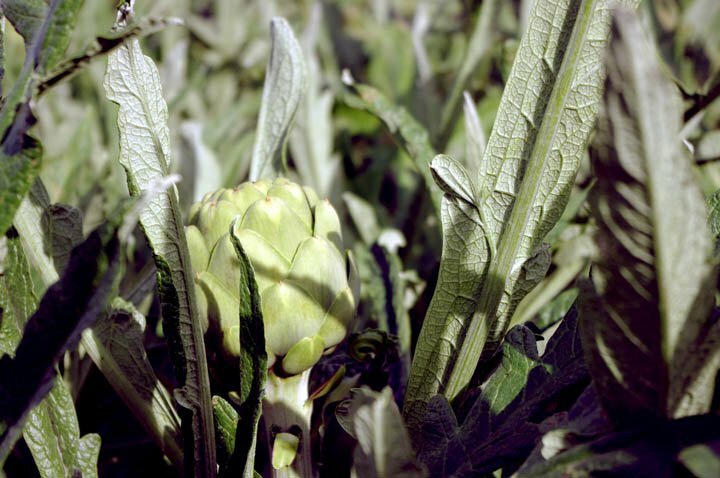 Remove tough, outer leaves of artichokes, trim, cut in half and scoop out choke. Rub with the lemons to keep from oxidizing and put in a bowl. 3. Put artichoke halves in boiling liquid and return to a boil. Cook for 10 minutes. 4. Pack into sterilized quart jars until 3/4s full and top off with hot liquid leaving 1/2″ headspace. Screw on lid until finger tight. 5. Process in a water bath canner for 25 minutes. 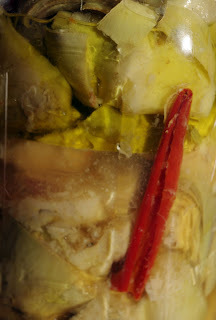 Remove from canner and allow to cool. Trust me, once you crack open a jar it won’t last for very long. This is now my favorite way to eat artichokes. Yum! I wouldn’t mind pickling a few gophers. This year the wretched beasts have succeeded in pulling 50% of our artichokes UNDERGROUND. Vanished…gone forever. If it’s not one thing here, it’s another. I’m hoping I can trap the rest of them while we still have some plants left, but the replacement artichokes I’ll have to plant in wire baskets just in case. Then hopefully next year I can try your recipe!